Anthony von Mandl is a humanitarian and entrepreneur who has dedicated his life to developing the wine industry in British Columbia’s Okanagan Valley. Because of his perseverance, passion and dedication to excellence, B.C. now holds a firm position on the world stage of wine producers. In realizing his vision for the Mission Hill Family Estate winery, he has created a world-class winery destination, where he continues to work at raising the international awareness and stature of agri-tourism in B.C. Mr. von Mandl’s generous support of the culinary, visual and performing arts has resulted in increased employment and business opportunities in the Okanagan region. On the grounds of the Mission Hill Family Estate he initiated the development of an education centre and outdoor performance amphitheatre, always seeking to further the cultural profile and uniqueness of British Columbia. 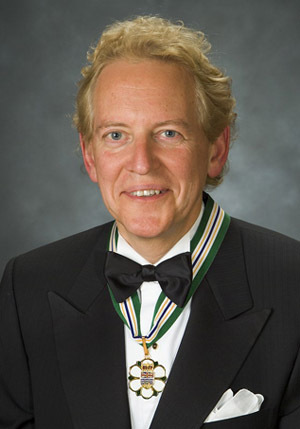 Mr. von Mandl was recently recognized as the first Canadian to be honoured as the President Elect of the prestigious International Wine and Spirit Competition in London, England.